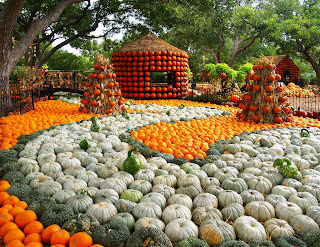 The Dallas Arboretum and Botanical Garden celebrates Autumn at the Arboretum featuring 75,000 pumpkins, gourds and squash and the nationally acclaimed Pumpkin Village, named one of "America's Best Pumpkin Festivals"
DALLAS, Aug. 18, 2015 /-- With the welcome change of seasons comes one of "America's Best Pumpkin Festivals" according to Fodor's Travel and one of the Dallas Arboretum's most anticipated events—Autumn at the Arboretum—which opens on September 19 and continues through November 25, 2015. Autumn at the Arboretum is supported by Alliance Data and Texas Instruments. The highlight of the festival is the nationally acclaimed Pumpkin Village, which is created with thousands of pumpkins, gourds and squash by the talented horticulture team. Dave Forehand, Dallas Arboretum's vice president of gardens, said, "As we say, 'Everything is bigger in Texas.' 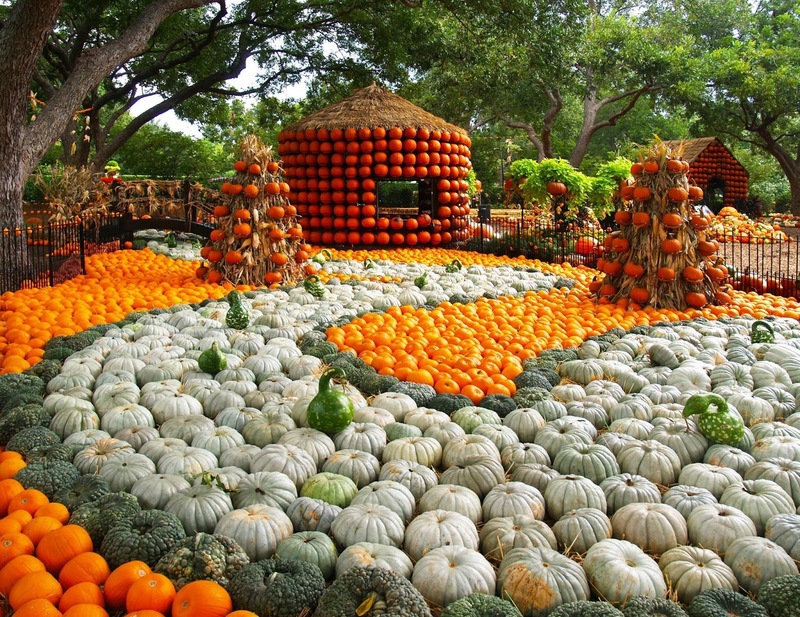 A jaw-dropping 75,000 pumpkins, gourds and squash is a record-breaking number for the Arboretum's Autumn Pumpkin Village and surrounding displays, so it is only fitting to recreate an Old Texas Town in the Pecan Grove. "Cinderella's carriage returns with thousands of pumpkins, hay bales and cornstalks artfully arranged throughout Pecan Grove, creating a popular photo opportunity for visitors." Forehand added, "Fall is one of my favorite seasons at the Arboretum. Many of the summer flowers like zinnias, impatiens, salvia and coleus, respond to cooler nights with blazing bursts of color. Our thousands of pumpkins bring out the color in banks of chrysanthemums that are layered with ornamental grasses, copper plants and firebush." Autumn is the perfect time of year for a picnic in the gardens or a leisurely walk among 150,000 fall-blooming flowers. The fall foliage, cooler weather and deep colors make Autumn at the Arboretum a must-see for locals and visitors. Guests will find unlimited opportunities not only to create lasting memories, but also to capture them in photos filled with beautiful backdrops of spectacular color. Many activities take place throughout the garden on weekdays and weekends during the festival kicking off with the 10th annual Tour des Fleurs 10K/20K race, presented by W. B. Carrell Memorial Clinic. Visit www.tourdesfleurs.com. Other events include Kimberly-Clark Mommy & Me Mondays and Tiny Tot Tuesdays, Monarch Migration Day, free garden tours, Cool Thursdays Concert Series, Oktoberfest Garten at Cafe on the Green, special music, Golden Hours photography and special discount days. Some events require an additional cost, so check the website for the latest information at www.dallasarboretum.org.